Am doing an afghan. Started out with metal hook and as a novice, was holding on too tightly. Just received the ChiaGoo flexible hook today. I love it already. It is making my progress so much easier! Q: Are the cables interchangeable? Could the hook be used to pick up stitches and then those transferred to a knitting needle? The cable extension would make this an advantage over my regular Tunisian hooks anyway. A: No, these are not interchangeable. 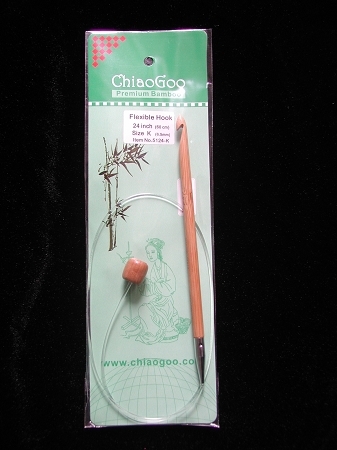 For interchangeable hooks we would recommend looking at the Knitter's Pride Dreamz, Ginger, or Bamboo. Q: What are these hooks make of - metal - plastic - wood ?